Prickly heat is a very itchy red skin rash, causing a prickling or burning feeling. It is medically known as miliaria. It may occur when you sweat a lot in hot or humid weather. Dead skin cells and bacteria block the sweat glands. The skin becomes inflamed with a spotty rash that may blister. These signs usually start around the neck. If it is bad, it can spread down onto the chest and back and up around the ears and face, but it seldom bothers a baby. Most forms of prickly heat do not need any treatment. The rash goes away eventually. It is more important to try to keep the baby cool. Don't be afraid to take off the baby's clothes in hot weather. After all, there's no evidence that early experiences with nakedness lead to children growing up to be nudists. 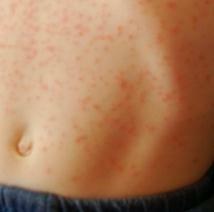 The rash usually lasts for a few days and then disappears on its own. Although it may last longer if the hot and humid conditions continue. Signs of Milaria include small red rashes, called papules, occur at a number of areas on a sufferer's body, the most common including the face, neck, under the breasts and under the scrotum. Other areas include skin folds, areas of the body that may rub against clothing, such as the back, chest, and stomach, etc. A related and sometimes simultaneous condition is folliculitis, where hair follicles become plugged with foreign matter, resulting in inflammation. In the most severe forms, salt crystals may form in the sweat-gland ducts, producing small blisters. Also known as sudamina this is the mildest form of prickly heat and is caused by a blockage of the sweat glands that are close to the surface of your skin. Visually you can see that it is characterized by tiny, clear papules that rupture easily. This is the most common form of malaria, that is commonly known as Prickly Heat. You can see the skin covered by red papules, itching and experience a sensation of pins & needles on the skin. This is the least common type, but it is the most severe form of miliaria in which the sweat leaks into the deeper layers of the dermoepidermal junction. This is a complication of miliaria rubra, where the skin papules become infected and from there begin to form pus filled pimples (pustules). Prickly heat is due the sweat glands becoming blocked when the weather is hot and humid. Dead skin cells and bacteria may block the sweat glands, leading to sweat being retained and building up on the skin leading to inflammation, which causes the rash. It is caused by sweat glands becoming blocked and inflamed due to excessive sweating. This in turn causes the sweat to leak into the deeper layers of the epidermis. Learn more here on our page about the causes and effects of excessive sweating. Prickly heat is more common in the summer months. People of any age can become affected although it is more common in children and especially infants due to their under-developed sweat glands. The symptoms relating to miliaria should not be confused with shingles as they can be very similar. Shingles will restrict itself to one side of the body but also has a rash-like appearance. It is also accompanied by a prickling sensation and pain throughout the region. Those who suspect they have shingles and not miliaria should seek medical advice immediately as the sooner antivirals are taken, the better. Prickly heat can be simply prevented by avoiding any activities that would induce excessing sweating, making full use of air conditioning to cool your environment, only wearing light clothing and in general making sure to avoid hot and humid weather conditions. Frequent cool showers or cool baths with mild soap can help to prevent heat rash. ~ Wear loose cotton clothing to encourage the evaporation of sweat and prevent further skin irritation. ~ Keep baths and showers cool• Leave a babies nappy off as often as possible. ~ Keep rooms cool (air conditioning will help). ~ Avoid heavy moisturizers. Tender newborn skin tends to be dry and in need of moisturizing. But heavy, oil-based creams can be a problem. Moisturize with a light, water-based lotion instead. In cases where the rash has developed into open blisters or pustular lesions a doctor should be consulted since more aggressive, medically monitored treatment may be required. Heat rash happens when the pores around your sweat glands become blocked. As a result, sweat becomes trapped under your skin, causing fine red spots or bumps that are on your upper back, chest or arms. This happens a lot to babies and young children. There is a small risk of heat exhaustion due to inability to sweat if the rash affects a large proportion of the body's surface area or the sufferer continues to engage in heat-producing activity. Very rarely, a prickly heat rash from excessive sweating can be dangerous. Normally, a common simple case of Miliaria / Prickly heat will be self limiting and will usually resolve itself in as little time as 24-48 hours. However, severe cases can last for a number of weeks and cause significant disability. General measures should be recommended for all patients, including moving to an air-conditioned environment if possible, avoiding sweat-provoking activities and occlusive clothing, and taking frequent cool showers. It has been suggested that the use of topical antibacterials (including the use of antibacterial soaps) may shorten the duration of symptoms in miliaria rubra even in the absence of obvious superinfection. Other topical agents which may reduce the severity of symptoms include anti-itch preparations such as calamine or menthol or camphor-based preparations, and topical steroid creams. Application of a cold compress to the affected area of skin will give some soothing relief whenever you need it. You can keep a bowl of iced water by the bed when you sleep, in case you wake up suffering from the prickling sensation on your skin. Oatmeal baths or calamine lotion to relieve itching. Make sure the water is not very hot. Stay indoors in the air conditioning if possible. Avoid any excessive rubbing of the skin. Only wear cool loose clothing. Try an application of a topical steroid cream if these treatment suggestions don't help. Normally any form of Ointment would be avoided as it can block the pores more than they already are. In most tropical areas the local dispensaries sell Prickly Heat Powder, a talc admixture containing drying milk proteins (Labilin) and Triclosan to fight the infection. These include cooling menthol to help alleviate difficulty getting to sleep. This is an effective treatment — the powder stays on the skin longer and treats bacteria dispersed into bed linens, providing a reasonably dry refuge area for healing. Consider that miliaria often covers large areas, and generous use of Cortisone may be contraindicated for reasons stated on package warnings. Regular talcum powder will not reduce the rash but can alleviate burning and itching. ~ Gently wash skin with soft gauze and lukewarm water and pat on a mixture of one part alcohol to three parts boiled water after cooled. Dust with Talcum powder or use baking soda in a little water than dust with talcum. ~ Try a cool compress. While a thin coating of mild, water-based moisturizing lotion may help stop the itching, cool compresses sometimes work better. Make a compress by dipping a washcloth in a mixture of one teaspoon of baking soda per cup of cool water. Apply to the rash for five to ten minutes. Do this four or five times a day. ~ Anti-histamine creams or medications will relieve the itch. ~ Calamine lotion BP and natural oatmeal based creams can be soothing. ~ Aloe Vera Gel Most skin conditions respond well to application on aloe vera plant extract. If you have the plant in your garden it can be applied directly. Otherwise commercial gels can be very beneficial. ~ Soak away the itch. To counter the itching that accompanies prickly heat, add some baking soda or a colloidal oatmeal product such as Aveeno Bath Treatment to a tub of tepid water or make your own oatmeal bath. A good soak will soothe the skin and take away the itching. Other agents have been investigated including supplemental vitamin A and C and vitamin A based medications, but it is worth noting that there is little scientific evidence supporting any of the above treatments in terms of actually reducing the duration of symptoms or frequency of complications. Further reading through our articles on Prickly heat health issues will give you a body of information that will help you decide what options you have to deal with the underlying causes of your problem through giving your body the nutrition products that will assist you body to heal from the inside out. We wish you well in your search for solutions to this Prickly heat problem and your movement towards better health in all areas. Learn more here on our page about the causes and effects of excessivesweating. Learn more here on our page about the causes of common skin rash. Keep Your Baby Safe in Summer and Avoid Prickly Heat! SITE DISCLAIMER: Do these products “cure” anything? Of course not… but it stands to reason that if you cleanse your body and feed it the finest nutrition available, giving it everything it needs in balance, on a daily basis, that your body will do what nature intended, and give you the best possible chance to fend off sickness and disease. This Prickly heat your health online information is not presented by a medical practitioner and is for educational and informational purposes only. The content is not intended to be a substitute for professional medical advice, diagnosis, or treatment. Always seek the advice of your physician or other qualified health provider with any Prickly heat questions you may have regarding a medical condition. Never disregard professional medical advice or delay in seeking it because of something you have read. Any natural and/or dietary supplements that are not FDA approved or evaluated must be accompanied by a two-part disclaimer on the product label: that the statement has not been evaluated by FDA and that the product is not intended to "diagnose, treat, cure or prevent any disease”. The Prickly heat resources on this your health online site are not intended to be a substitute for professional advice. While all attempts have been made to verify information provided in this publication, neither the author nor the publisher assumes any responsibility for errors, omissions or contrary interpretation of the web site Prickly heat subject matter herein. The what is Prickly heat your health online site Prickly heat contents are solely the opinion of the authors and should not be considered as a form of advice, direction and/or recommendation of any kind. If expert advice or counseling is needed, services of a competent professional should be sought. The what is Prickly heat author and the Publisher assume no responsibility or liability and specifically disclaim any warranty, express or implied for any products or services mentioned, or any techniques or Prickly heat practices described.